IA Design were engaged by global financial firm, Dimensional Fund Advisors, to design their new offices located in Level 24, 120 Collins Street, Melbourne. A priority of the design brief was to celebrate the Melbourne skyline and create a reception area that the team could hold client functions in. This was achieved by integrating an operable wall into the boardroom that opened into the reception area to create a welcoming event space. 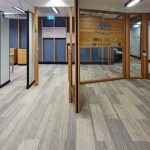 To complement the adaptable office arrangement, a neutral colour palette was adopted throughout the environment – extending from the reception area to the back offices. The end result was a highly aesthetic, versatile environment that successfully addressed the workplace needs of the Dimensional team.